Hybrid Publishing Lab: Your projects set the example of what is possible in publishing. Still, a lot of academics don’t make use of the potential new technology offers. What do you think keeps them from making use of it? Gary Hall: Before we begin, I just need to make a quick qualification. I’m going to be using the pronoun ‘I’ a lot here – which may look as if, in spite of everything, I’m still insisting on acting according to the liberal model of an academic. It’s a model that forecloses an appreciation of the collective nature of identity and instead presents the work of a writer or theorist (such as myself) as the original creation of an individualized and individualistic proprietorial human subject. Now I know it’s not necessarily what you meant to imply with your question. Still, it’s worth emphasizing that the projects you’re referring to here shouldn’t be seen as ‘my’ projects in any simple sense. [i] They arise out of a complex and ongoing collaborative relationship with a number of different authors, groups, institutions and actors, including all those currently operating under the names of Culture Machine, Open Humanities Press and the Centre for Disruptive Media. 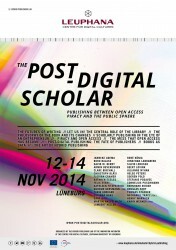 [ii] (Clare Birchall and Janneke Adema, who will be speaking at the Post-Digital Scholar event, and are just two of those who should also be mentioned in this context.) It’ll become clear shortly why I wanted to begin with this qualification. Now let me try to address your question directly. As far as many academics are concerned, publishing is first of all just something they’re required to be involved in as part of their professional activity. They may think about politics in relation to culture and society, or even other parts of the media (the BBC, Twitter, algorithmic regulation and surveillance etc.). Yet, unless they’re caught up in the movements for open access, Creative Commons, free software, peer-to-peer file sharing or anti-copyright pro-piracy – and even then in many cases – the majority of academics don’t spend too much time reflecting on the politics of their own knowledge production, let alone trying to challenge or change it by making use of the potential for doing so offered by new technology. Little heed tends to be paid to what it means to publish with a profit-maximising transnational corporation rather than a non-profit publisher, for example, or on an ‘All Rights Reserved’ rather than a copyfarleft basis. As a politico-institutional system of production and control, complete with its inherited disciplinary practices and protocols of status, advancement, recognition and credibility, publishing has become so naturalised and accepted that, unless something out of the ordinary happens – a change of policy imposed at government, funding agency or institutional level, or a campaign mounted such as the 2012 boycott of Elsevier – it’s not something that academics are either especially willing or able to devote much critical attention to. All too often it’s simply there for them, as a fundamental part of their world and everyday practice, yet for the most part unremarked upon, unnoticed, unthought. HPL: You have recently completed a monograph called Pirate Philosophy that argues in the light of the most recent crisis of capitalism for a post-crash critical theory. How can piracy influence academic thought? Goldberg does not analyse the specific frames that constitute the conditions of possibility of critical theory in too much detail in ‘The Afterlife of the Humanities’. Instead, he prefers to sketch what the humanities could look like that if they were reconceived and remade so as to be able to ‘speak to our times’. And it’s this lack of detailed attention to the specific frames that order and shape critical theory that perhaps explains why, for all his emphasis on ‘eschewing imposed and established frameworks’, Goldberg’s understanding of the power of the humanities today itself often operates within quite conventional humanist and humanities terms and limits. That the humanist subject does indeed still occupy a central place in the world for Goldberg is apparent not least in the approval he shows for Zadie Smith’s review of the film The Social Network, and with it Facebook. [v] Her profoundly liberal humanist analysis offers what he describes as a ‘very thoughtful take’ on ‘how digital media generally and social networking applications in particular have changed how we live our lives, communicate and connect, work and play’ – of the kind we need more of in the academic humanities, it seems. Nowhere is theory’s thinking within the faded frame more evident, however, than in the way it continues to be dominated by the print-on-paper codex book and journal article, together with many of the core humanities concepts that have been inherited with them. The latter include the unified, sovereign, proprietorial subject, the individualized author, intellectual property and copyright. But they also include the signature, the proper noun or name, originality, the finished object, immutability or ‘fixity’, the book, the canon, the discipline, tradition, even the human, along with the liberal democratic institutions that sustain and support them: the university, the library, the publishing house and so on. Pirate Philosophy is thus an attempt to raise a question that’s also an exhortation: how can we act differently with regard to our own work, roles and practices – to the point where we actually begin to confront, think through and take on (rather than take for granted, forget, repress, ignore, or otherwise marginalise) some of the implications of the challenge that is offered by theory to fundamental humanities concepts such as the human, the subject, the author, the book and copyright for how we create, perform and circulate knowledge and research? HPL: How can piracy influence academic thought? None of this is to suggest we can’t have laws or make judgements and decide some things are acceptable and legal and others are not. But it does enable us to better understand the aporetic and violent basis on which we do so; and so try to assume and endure this ambivalence of authority in our politico-institutional practices and decisions, rather than simply repeating it and acting it out. In other words, it’s about acknowledging the necessity of making such interruptions or cuts in relation to our ways of being and doing in the world – including how we publish, with whom, on what legal basis, reserving which rights – and thinking about how to make them well, or at least better. HPL: Do you see a potential of piracy for publishing? What is your take here? The multi-thematic and poly-centred aspect of my take on these issues relates to the importance placed on zigzagging, non-linear thinking by theorists such as Rosi Braidotti as a means of responding to the complexity of the global economy and paradoxes of the posthuman era. But it’s also designed to complicate and make that little bit more difficult – or at any rate to not simply go along with (while at the same time acknowledging it’s impossible to elude such a possibility entirely) – any attempt to stabilise and solidify the theory I’m endevouring to perform into a would-be fashionable intellectual brand in its own right. You know the kind of thing: a big, ‘masculine’, explanatory and empowering theory of pirate philosophy and pirate publishing that could be set up in a relation of competition and rivalry to other big, explanatory and empowering theories and philosophical systems. A theory moreover that could be repeatedly blogged, tweeted about and sold as my original work, intellectual property or trademark in order to reinforce my own expertise and position in the academic market place, and thereby gain advantage in the struggle for attention, recognition, fame, authority and disciplinary power. (For similar reasons, as well as experimenting with writing collectively and publishing anonymously in my work, I’ve also shifted continually between different theories and concepts such as open media, media gifts, liquid theory, radical open access and disruptive media.) Instead, I’m trying to foster more anti-liberal and anti-individualistic ways of producing, publishing and disseminating knowledge and research by emphasizing that any enactment of something like a pirate philosophy is only possible by getting close experience of, and trying, testing, teasing and troubling the theories and philosophies of others. HPL: Which book will you always have as an analogue copy on your bookshelf? Hall: As a human subject living in this particular place and time, with an affective attachment to certain media and forms of knowledge, I do of course have many copies of analogue books of all kinds on my shelves. So I can appreciate why you might ask me this question. But I hope you’ll forgive me if I complicate things once more. It’s just I’m finding it difficult to come up with a straightforward answer that I’m comfortable with: one that can’t all too easily be mistaken as some kind of defence on my part of the liberal model of what it is to be an academic and theorist I’m endeavouring to pay critical attention to. Wouldn’t saying I’m always going to have an analogue copy of a specific book, along with a bookshelf to store and display it on, risk giving the impression that, no matter how much the projects I’m associated with may be trying to challenge notions of the possessive individualistic human subject, the finished object, immutability and so forth, I don’t really want things to change that much? In The Birth of Biopolitics (which at the moment I do have, although it’s not an analogue copy), Foucault argues that liberalism – a word he presents as coming to us from Germany – needs to be analysed, ‘not as a theory or an ideology… but as a practice… as a “way of doing things”’. [x] I’m mentioning this here because Foucault’s insistence on approaching liberalism as a practice can help us to understand something important about our ways of doing things. For while many of us may espouse non-liberal and even explicitly anti-liberal (including anti-neoliberal) theories and philosophies – be they inspired by Marx, Foucault, Deleuze, Haraway, Latour or Laruelle – we are liberals nonetheless by virtue of how we live, work, act, write and speak in the world. That liberalism does indeed continue to play a relatively uncontested role within academic scholarship and research – in the forms our writings take, in our upholding of ideas of individualism, individual rights, property and so on – is something we’ll perhaps have a chance to talk more about at the Post-Digital Scholar Conference. [iii] Rhian E. Jones, Clampdown: Pop Cultural Wars on Class and Gender (Winchester: Zone Books, 2013). [iv] David Theo Goldberg, ‘The Afterlife of the Humanities’ (Irvine, California: University of California Humanities Research Institute, 2014), http://humafterlife.uchri.org/. [v] Zadie Smith, ‘Generation Why’, The New York Review of Books, November 25, 2010, http://www.nybooks.com/articles/archives/2010/nov/25/generation-why/0. [vi] ‘Etymology of Pirate’, English Words of (Unexpected) Greek Origin, accessed September 12, 2014, http://ewonago.wordpress.com/2009/02/18/etymology-of-pirate/. [vii] Adrian Johns, in Serena Golden, ‘Piracy’, Inside Higher Ed, February 3, 2010, http://www.insidehighered.com/news/2010/02/03/johns; and Adrian Johns, Piracy: The Intellectual Property Wars from Gutenberg to Gates (Chicago: University of Chicago Press, 2010). [viii] Saint Augustine, The City of God Against the Pagans, ed., R.W. Dyson (Cambridge: Cambridge University Press, 1998) IV.4, 148.
philosophical, legal and practical implications of book piracy through the creation of a platform designed to ‘explore the spectrum of copying, re-editing, translating, paraphrasing, imitating, re-organising, manipulating of already existing works’ ( http://www.andpublishing.org/projects/and-the-piracy-project). [x] Michel Foucault, The Birth of Biopolitics: Lectures at the Collège De France, 1978-79 (London: Palgrave Macmillan, 2008), 22, 318.